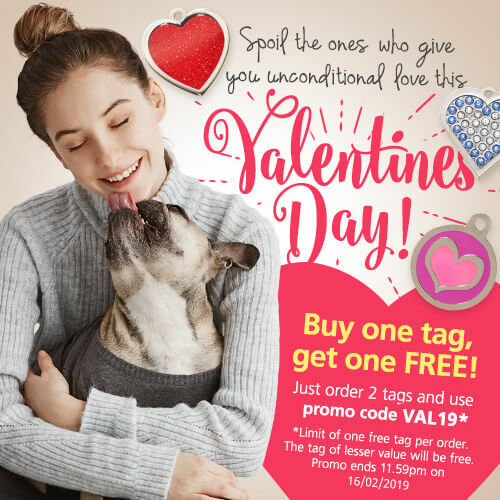 Our pet tags are made from the best quality materials and our range includes a huge variety of different materials, shapes and sizes to suit every type of dog or cat. All tags are supplied with a strong split ring for attachment to your pet's collar. Please ensure that there are no other objects attached to the collar to compromise the lasting quality of your tag. Our pet tags are made from the best quality materials and our range includes a huge variety of different materials, shapes and sizes to suit every type of dog or cat. All tags are supplied with a strong split ring for attachment to your pet's collar. Please ensure that there are no other objects attached to the collar to compromise the lasting quality of your tag*. Exciting range of fun, stylish tags in a variety of shapes and colours – from sparkly fish to colourful bones and paws! Tags are made from rust proof brass, and images are epoxy coated for extra protection and guaranteed against breakage and fading. All designs are engraved in a clear upper case font. These round metal alloy tags, finished in nickel, feature colourful enamel images on the front – from gorgeous hearts and flowers to bones, paw prints and kennels. They are epoxy coated to ensure the image won’t fade or get damaged, and all except ‘Meow’ come in a choice of 3 sizes. All designs are engraved in a clear upper case font. Our attractive Glitter tags are made from rust proof nickel and steel, reflect at night and are epoxy coated to ensure the enamel image won’t fade or get damaged. They come in a range of sparkly colours and designs and make a great accessory for any stylish dog or cat! All designs are engraved in a clear upper case font. These stunning tags are set with genuine, sparkling Swarovski crystals in a range of colours and designs, and are a must for trendy dogs and cats! They are made from tough metal alloy with a silver or gold finish and are engraved in a clear upper/lower case cursive font. Brass tags look very classy and are more suited to dry climates and for pets that don’t go in the water. They come in a range of sizes and shapes, including rounds, hearts, bones and stars. Tags are engraved in a clear upper case font. Stainless steel is the most durable material, and these tags are purrfect for pets who go in the water a lot, or those especially active pets who can be rough on their tags! Nickel tags will oxidise if exposed to water, so are suited to dry climates and for pets that don’t go in the water a lot. They come in a range of sizes and shapes, including rounds, hearts, bones, stars and cat and dog faces. Tags are engraved in a clear upper case font. Our durable range of anodised Aluminium tags are strong and lightweight and can be laser engraved on both sides in a clear upper case font. They are not suitable for pets who like to chew their tags. They come in a range of eight colours and various shapes, including rounds, hearts, bones and cat faces. All our tags are engraved using our state of the art laser engravers and are guaranteed for 5 years against breakage and fading*. *Conditions apply. Please refer to our Guarantee and Replacement Policy, below. 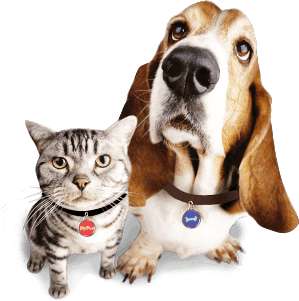 You can choose what information you would like to have engraved on your pet’s tag. We recommend the pet’s name plus one or two contact numbers. Many pet owners prefer not to include an address on their tags for security reasons. Many tags can be engraved on the front and back, and you can choose what information goes on each side when you place your order. Tags that feature images on the front can only be engraved on the back of the tag. The more information you require, the smaller the text will be. As our tags are deeply laser engraved, your tag/s may arrive with some cloth fibres still attached, or even with a bold finish. If this is the case, simply wipe over your tag/s with a cloth (e.g. polishing or jewellery) to smooth over the engraving and/or remove any excess fibres. All pet tags are guaranteed for 5 years from the date of purchase against breakage and fading*. Lost tags and replacement split rings are not covered under this guarantee. Should you wish to order additional/replacement split rings, a small fee for postage and handling will be charged. Our Bling tags are guaranteed against breakage and fading* for 5 years and for 1 year against the loss of any crystals*. - A photo of the tag and in some cases the return of the tag, is required under the terms of this guarantee. Replacements, whereby a photo of the broken tag cannot be provided, are at the discretion of Pet-Tags. - Please note that our replacement guarantee does not cover broken split rings, faded tags caused by the tag having been chewed, or where there are other items attached to/near the tag. This causes friction with the metal, causing the outer layers of the tag to wear away. For replacement eZeClip requests, a photo of the clip via email will be required and in some cases, we may request return of the clip. Please contact us to discuss prior to sending back your clip. If we have sent you a faulty tag, the wrong tag or have engraved information on your tag that is different to the information originally provided, simply fill in our tag correction form, ensuring you provide a photo of your tag/s and we will gladly send you a replacement tag free of charge. In the event of a claim under our guarantee, we may request return of the tag. Please note, we are unable to make changes once your order has been processed. Please check your order information carefully, we are not responsible for the accuracy of the information you have submitted. Ready to start shopping? 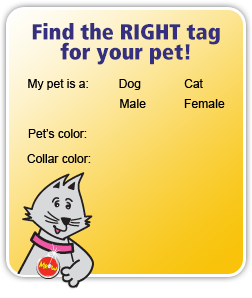 You are sure to find the right tag for your pet from our six tag ranges. your pet from our six tag ranges.